Your opinion matters. Leave A Review Or Edit This Listing for Mayflower Community Outreach . 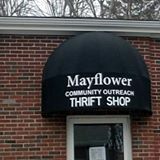 Here at Mayflower community out reach we are 100% nonprofit thrift shop including a food pantry all profits from the thrift shop and the wonderful donations we received a salad thrift shop from our wonderful community members all go to buy food for our food pantry we are members of South Shore community action Council food bank. We stay we also are open late on Thursday evenings till 7:00pm. However if it's an emergency please call. We will be there to help you with whatever you need reach out to us here at Mayflower community out reach we do not judge we are zero stigma don't be afraid to reach out to us for help of any kind. We always need more information on our pantries. If you know of any details, volunteer information, website, hours or more description information about Mayflower Community Outreach please add a comment (below the map on this page), with information. We will then display this for all visitors on this page.